I recently read an article circulating on Facebook that has gathered quite a bit of steam. It is a letter from a young woman to her mother about her self-esteem issues arising from repeatedly hearing her mother disparage her own body. As she explains, she thought her mother was beautiful, but her mother lived in a world of dieting, negative self-talk, and disappointment. Not only was it disheartening for the daughter; it also caused her to repeat the same cycle when she got older. We know that teens, especially, are under a constant barrage of pressures to have certain body types. They get it from advertisements of every sort, parents, friends, boyfriends/girlfriends – virtually everywhere they turn. And the sad thing is that they all have very different bodies. I’ve had students who were so petite they had to shop in the children’s section. I’ve had female athletes with muscular thighs that precluded them (they thought) from wearing the coveted yoga pants and male athletes that ran the gamut from 120 lbs to 220 lbs. Boys and girls in various stages of development, some looking like children and some like grown adults, roam the hallways, all surveying one another and asking themselves how they size up. Introduce the hunks and beauties from the entertainment world, and teenagers really don’t stand a chance when it comes to avoiding comparisons of body type. And that’s actually a good thing. Because if your children reach high school and haven’t learned to be their own people yet, I’m here to tell you, it’s okay. They have time. It’s not too late. In fact, I would say that they’re probably exactly where they should be, emotionally. Scary, yes, but developmentally, quite correct. BUT – and this is a big BUT – now is the time to help your teenager discover his or her true self. These are the years when most kids begin to realize that it’s okay to be different. That their peers (not all of them, but a good number) will accept them for their individuality. That their friends are becoming mature enough to appreciate them for what they do well and ignore the parts that don’t matter. This is the time when confidence reigns supreme and they realize that they will do much better in life if they present themselves with assuredness rather than timidity. Parents are positively key when it comes to this transition. No, you can’t tell them how great they are because you’re their parents and of course you think they’re great. That really carries little weight with them. Instead, model confidence and self-acceptance to them. Refuse to criticize your own body. Let your conversations focus on your job successes, an obstacle you overcame, your pride in an accomplishment, your intense drive to reach a goal. Do the same when you speak of other people, rather than focusing and commenting on their looks.When you praise your kids, praise specific accomplishments. It’s certainly okay to be attractive and it’s fine to acknowledge that, but the vast majority of your compliments should target other, more substantial areas of strength that your kids can actually control. That’s where true self-esteem should come from. In a nutshell, note your own, their, and other’s successes of substance, not superficiality. In that way, you will grow young adults with strong, positive priorities who understand and convey to the world that they are so much more than their weight or body type. 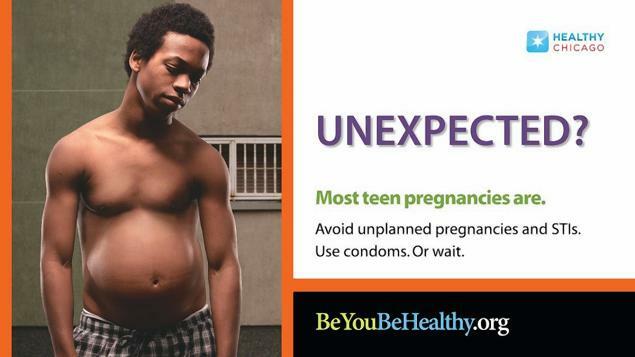 Do shocking teen pregnancy ads work? This ad is one of many appearing in Chicago bus and train stations. The purpose is to grab teens’ attention and make them realize that pregnancy is not just the responsibility of girls. I like the idea and think it definitely does the job of hooking its audience. However, will it make a difference to teens who are sexually active or who are thinking about becoming sexually active? I can’t see it. I remember Nancy Reagan’s “Just Say No” and the egg in the frying pan with the tag line, “This is your brain on drugs.” I don’t think either of those wildly successful advertising campaigns actually made a difference. I think they were just well-executed commercials that got people’s attention. There’s a difference between shock value that makes you sit up and take notice and shock value that actually causes you to make a life change. Pregnant boys on posters? Not a life-changer.